Available languages : English, Spanish, French, Portuguese, German, Russian, Polish. Welcome to LottoKings.com, an online lottery agent website that offers to its players way more than what came to be this gaming niche’s standard – available lotteries and raffles, leading features, a well-polished user interface that really puts the different pieces of the puzzle together. The brand started its life as CongaLotto.com and was re-branded and revised with a very successful and complete overhaul. This new revision of the very experienced previous operation achieved a significant milestone by adopting latest web technologies and aligning with the leading online lotto agents – platform (Mobile, Tablet, and Desktop) compatibility, user-centric UI, customer support 3rd party services, banking options, etc. – while still keeping the lead of the platform. The end result for the transition is a very slick and enjoyable experience – navigating and completing the needed actions for securing a lottery or raffle ticket. A leading feature I love, and most players come for, is the option of completing a purchase or wager on any one of the 21 world popular lotteries from USA and Europe or 3 Spanish raffles. The selection seems to grow periodically. All from the comfort of home PC (Desktop) or on the go using a mobile device – Tablet or Mobile. A company called Triangulum N.V., based at Landhuis Groot Kwartier, Groot Kwartierweg 12, Willemstad, Curaçao, is the owner of the LottoKings’ brand and complete operation. LottoKings is owned by Triangulum N.V., which is located at. It also could be reached by email address info@lottokings.com or online contact form. Language (7 supported): English, Spanish, French, Portuguese, German, Russian, Polish. Richard might have won the lottery 7 times, but this alone is not enough to be sure he knows something no one else does. Use at your own discretion. When I review a new lottery agent’s website, years of industry relevant experience come into play. This case – an existing site that underwent a complete restructure and is now being reviewed for the 2nd time – is no exception. Security – What effort and which measures LottoKings is making to keep its visitors and players safe and secures, and were any red flags raised during the research for the review. Products – What lottery products are offered to players and how they stack up compared to other service providers. Features – Which features are available for players in order to improve their overall experience. Platforms – Who well does LottoKings support the different platforms and whether mobile apps are available. Promotions – Does LottoKings have promotions and loyalty schemes for its users. Support – How easy it is for players and potential players to get a clear answer to frequently raised issues and, if needed, reach LottoKings’ customer support. LottoKings takes adequate precautionary measures to allow its players a worry-free gaming session on the site. Other than the technical aspects of meeting security checkpoints, there is a brand reputation that Lottokings holds. Encryption – Site security starts with a secure HTTP connection – HTTPS – and Lotto Kings meet the requirement. The certificate is valid and issues by s reputable issuer – Go Daddy. The certificate also identifies the site’s owner. There the secured connection green icon only at the wallet section of the site. Google Safe Browsing – Google survey millions of sites for signs of malicious content or intent as part of a service called Safe Browsing. Querying for Lotto Booking return there’s no issue with the site – link. License – Lotto Kings is an e-gaming licensed operator at Curacao. Being regulated as a trust indicator as there’s a professional supervising body issuing licenses. Trust Certifications – Lotto Kings site’s footer has some trust icons embedded. Curacao license, Go Daddy verified and secured SSL certificate, and a hacker protected link to a page with an unclear security scan counter. For this review aspect, only Curacao’s icon and Go Daddy’s account as relevant certification. While HTTPS is a standard, Go Daddy’s certificate is of a known issuer, and a Curacao license is an added trust sign – Lotto Kings are cleared to players to signup and complete a purchase. LottoKings.com offers state of the art encryption using SSL technology with a secure HTTPS connection issued by one of the world leaders in SSL certificates which is Godaddy. The site owner information is readily available and all transactions on the website are SSL secured. Using Google safe browsing also returned a green light for this website which is a huge plus factor. Another good trust indicator is that LottKings.com is a licensed e-gaming platform and as such means that are regulated as online gaming operator by the Curacao Gambling Authorities. By this law enforcement, which means they have to adhere to strict industry standards, your entertainment time is well secure. 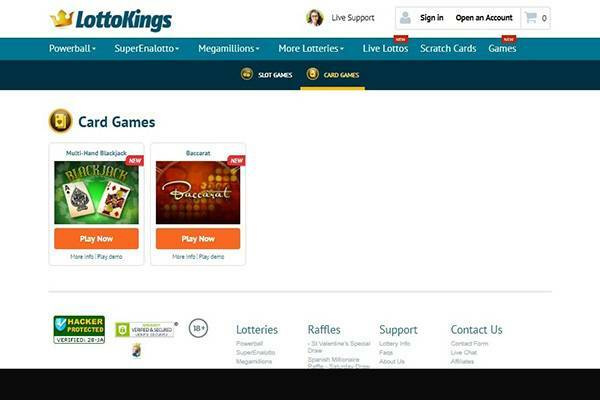 Lotto Kings is based on Congalotto’s dedicated platform, that has since re-branding much evolved, and so have the means of offering it’s players products others can’t. Single Line – the First draw to online lottery is the option of purchasing a single lottery line – lottery could be of any one of the global ones. It is the product on which all others are based on. The world lotteries available (21) are: Euro Millions, Thunderball, EuroJackpot, MegaMillions, Lotto (Germany), SuperEnalotto, UK Lotto, Loto (France), Irish Lotto, La Primitiva, Mega Sena, Lotto 6/49, Hot Lotto, Hoosier Lotto, Super Lotto, Powerball, Lotto (Florida), Lotto (NY), El Gordo, OZ Lotto, and OZ Powerball. 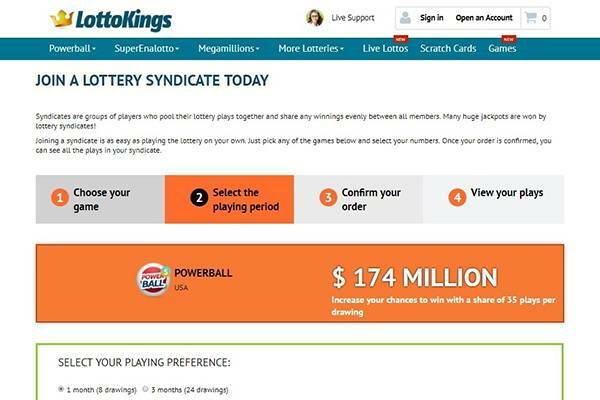 Syndicate – Lotto Kings have two ticket pools for players to choose from offering the best odds of winning for the lowest cost. Lottery pool has the best odds of winning a prize, but the accumulated prizes are split between all shareowners. Each lottery has a different number of tickets in its pools and a different number of shares for sale. 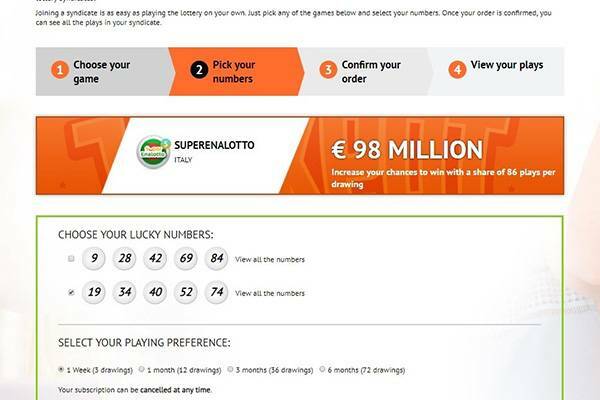 The lotteries available (4) are SuperEnalotto, Powerball, EuroMillions, MegaMillions. Raffle – Raffles are missing from most online lottery tickets sellers, and for no good reason – the prizes are significant and where the winner doesn’t share his prize as only one ticket wins. Lotto Kings offer the Spanish weekly Millionaire raffle (draws on Saturday and Thursday), the monthly special, and the biggest in the world… Navidad. 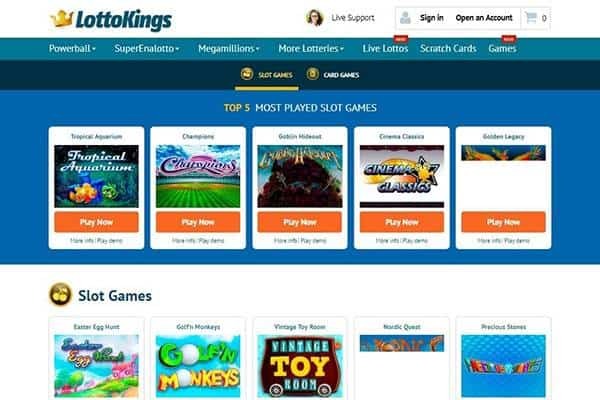 Lottokings.com being an offshoot of the Congalotto.com has had good experience in this space and as such, this means they are able to use their client data to ascertain the best games they should bring to their website. Consequently, they have chosen 20 of the best lotteries available around the world along with 7 scratch card offers and unlike many other providers, they also offer raffle options. Additionally, they also offer single line and multi-line draws which allows players to prepay for close to 52 draws. Features support the product line and make for a positive LottoKings player experience. Number of Draws – Pre-purchase the same ticket for future consecutive draws – 5, 10, 20, 25, 50. Subscription – Auto renew game – re-purchase the same product right after the last ticket’s draw. Quick Pick/ Auto Pick – Quick pick is a one-click auto pick all added tickets. This refreshes any manually picked numbers. The ticket auto pick auto-completes the missing numbers of a ticket. My Numbers – When completing a ticket purchase, there’s a checkbox saving the picked numbers to the personal account for future purchases. Alert – Lotto Kings have a truly remarkable and flexible alert system giving players the option of configuring alarms to any of the available lotteries for results or Jackpot. Setting an alert is simple – directly from the purchase screen or a dedicated alert page. Highly recommended for avid lottery players. Cart – Checkout using the cart is clear and simple – there are basic product editing options. There’s a Quick Play section for players to quickly add tickets to one draw of a few top lotteries. Features are integrated perfectly to provide a solid lotto experience. Alert system is useful and carries a lot of player value. The cart is balanced between e-commerce and e-gaming, and serve the needs of both. Chapeau! 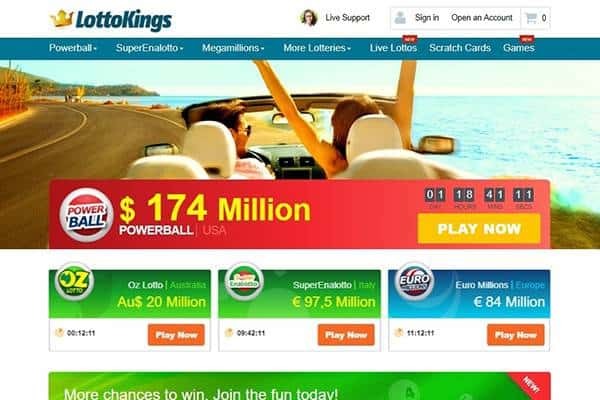 LottoKings.com certainly deliver when it comes to the range of games and features they offer with some of the big names in the industry such as Powerball, SuperEnalotto, Megamillions. They are truly global as well offering French, Irish and Canadian lottery options on their platform. You will be able to find online lottery tickets for mega jackpots all over the world. Besides the main lotteries mentioned above, you will also find EuroJackpot, La Primitiva, ThunderBall, Euro Millions, Germany Lotto, French Loto and many more. Take into account we are talking about prizes that can reach more than $100 million! A one really cool and simple feature is something called a quick purchase feature which allows you to purchase tickets to most worldwide lotteries almost instantly. You are notified almost instantly of your winnings via email. The player’s options are great as well which include either single play games or you can join a syndicated game which will pool all of your resources together and of course greater increase the chance of you winning. Lotto Kings have the experience and know how to provide its players with a tailored and polished experience across all devices. They’ve been around for many years as Congalotto and now launched a completely new brand Lotto Kings. You will be able to buy online tickets or just check the latest results from your desktop, tablet or smartphone (Android, iPhone and Windows Phone). Desktop – Great support for wide screens with smart use of both colors and height. The thought put into this site is noticeable across all pages. Beautiful. Tablet – As with too many sites, there’s no dedicated tablet view, but mobile stretched. It’s a minor disappointment as the mobile view sits ok with the much bigger screen of a tablet, but there’s still so much more that could be done to improve the experience. Mobile – In a mobile-first world, this is the screen to put most effort to – there’s little “room” and so require optimizing features and visual elements. Lotto Kings did well to forfeit banners and icons and stay to the point. The site looks very functional and easy to use and navigate. The bottom menu is spot on. Probably one of the top in online lottery. Desktop and mobile are top notch. Tablet is OK, but the other two platforms out shadow it. Even thou Lotto Kings do better on tablet than other operators. High expectations damage this review aspect’s score as applications were expected. It’s probably coming soon. top10bestonlinelotto will be here to update. Lottokings.com is open to all players from around the globe and is accessible through 7 languages and supports the following currencies: US dollars, British pound and Euro. We love the user-friendly design and the development team have done an outstanding job in ensuring the platform is bug-free, runs fast and of course is mobile friendly and can be played on your favourite devices such as Mobile Devices, Smartphones, Tablets and is available on both the iOS and Android platforms. Customer Service’s availability is key to keep players playing for a long time. Player rightfully have zero tolerance for poor service. Live Chat – Available daily between 8:00 to 19:00 UYT, and easily accessible on Desktop, but so much on tablet and mobile (you have to login and ask for a desktop view). I appreciate the option of live chat as it is not that common with smaller online lottery agent sites, and missed when urgent assistance is needed. Phone – Lotto Kings publish two phone numbers – one for America, and another for Europe (UK number). There’s no mention of operating hours, but they’re most likely identical to chat’s. Email – There’s a direct email address for any inquiry – info@lottokings.com. Contact Form – Contact Us page includes, other than the basic contact details, a contact form. Has too many mandatory fields. 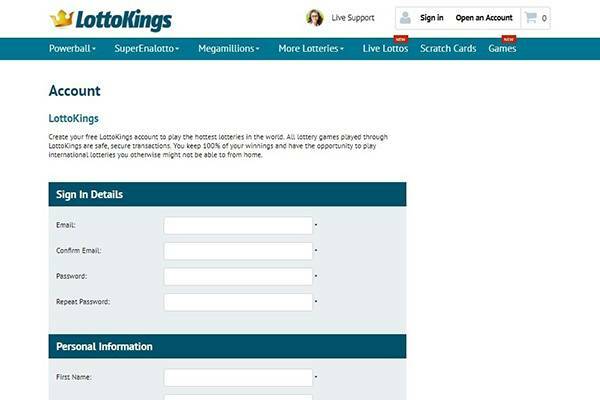 Lotto Kings make a genuine effort to make them available to players – there are multiple means to contact them and operating hours are reasonable – there are too many operators that publish 24 hours support but can’t back it up. LottoKings.com certainly do not let us down in the support department with full coverage including 24/7 live chat support option which is available in 8 different languages as well as dedicated 24/7 telephone lines. Additionally, they can be reached via email and the contact form on their website. Is LottoKings legit or fraud? At this point most want to be absolutely sure – is LottoKings a scam or a legitimate online lottery tickets agent. The answer is that Lotto Kings is without a doubt a trustworthy operator. There is the effort taken into security and the service given to players. You’re welcome to read an in-depth legitimacy audit here. In addition, licensed by the Curaçao Government and working under strict encoding (SSL) all your activities are safe (both gaming and transactions). LottoKings.com is a well-established industry player and knows how to please their customers in a safe and secure environment. We absolutely love the support options they offer and a great range of games which are available to their international players. No doubt, you will find the hugest lottery prizes on the entire planet and will be able to play them without any restriction very easily. As a result, LottoKings.com are the guys that set the standard in the industry and for this reason, they get a solid 4/5 rating from us. A big thumbs up to Lottokings.com.